Steve does all the cooking at home and his signature dish is Nachos with fried onions and fried chicken. He does tend to serve big portions and, like a lot of us, feels guilty if his plate isn’t empty at the end of the meal – a throw-back to our up-bringing eh? The only problem with that is if he is serving up rather large portions, then he is eating quite a lot to get his plate cleared! But it also has a LOT more calories and a LOT more fat! His nacho dish is also a heavy-weight contender with a whopping 229grams of fat. Two and a half times what he should be having in a whole day! ‘I know what a diet is but I’ve never really been on one. To me a diet is putting on a page all what you like and on the other page what you don’t like right, start your diet just eat all the page that you don’t like and then you’re on a diet.’ Uh oh! Will Steve be willing to change his favourite foods and will Gizzi be able to get the idea across that you can lose weight while still eating tasty food? Steve said he was genuinely looking to change his cooking habits which definitely pleased Gizzi. Hopefully, Gizzi will be up to the challenge! Gizzi asked Steve if it was ok to have a rummage in the cupboards and fridge to see the sorts of things he had. He said she was welcome so she started off with the fridge. The first thing she found was sausages and she pointed out to Steve that the particular brand she found only had 42% meat. When a sausage has such a low meat content, it is usually bulked up with saturated fat – that’s bad fat! But Gizzi pointed out that on the front of the packet, it stated it had 24grams of fat which was quite high – so not as good for you as Steve thought eh? But, an easy mistake to make and we have all done it! Then she found some chocolate cake. She told Steve that having pudding every day isn’t good for you. Steve said it wasn’t a pudding, it was only a slice of cake! Gizzi carried on rummaging and found a big stash of biscuits and cake. ‘I’ve never seen one of those before.’ And you’re not alone Steve! Smoked chicken skin doesn’t taste nice and contains lots of fat so it needs to be removed. Gizzi also de-seeded the cucumber because she said they contain a lot of water and when you’re taking your lunch to work you don’t want it to get all soggy. Steve was definitely making all the right noises! Steve’s easy, fast-food burger meal stomps in at 950 calories per portion. 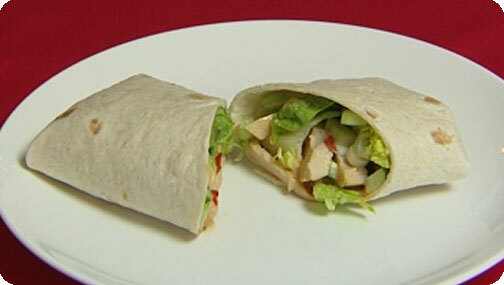 Gizzi’s indulgent Bang Bang Chicken wrap, tastier and lower calorie, is just 335 per portion. A little over a third of the calories of Steve’s normal meal. ‘So all I need to do now is be in me car and you stand at the window, I’ll drive in, get it and drive away.’ Cheeky scamp! ‘He’s in the car all the time, he doesn’t walk anywhere. He can’t walk even round the shops for very long because he gets out of breath and, obviously, I worry because that’s my future as well isn’t it? Cos I don’t want to be without my husband.’ Awwww so sweet! But, like a lot of us, Steve hasn’t always been big. At 23 he was around 11 and a half stone. 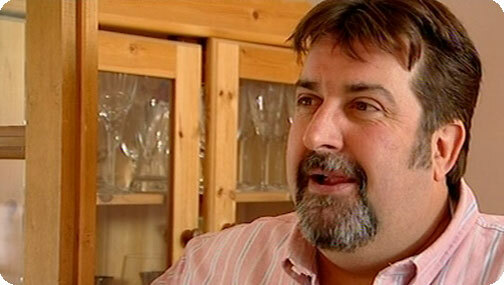 At 49 and three quarters (as he describes himself) he is now nearly 20 stone. He describes himself as being as fit as a cello! Exercise is not a big part of Steve’s life but, we all know, we need to move it to lose it. He said the most exercise he gets is squeezing the toothpaste and getting in and out of the car. If, while he’s waiting for passengers three times a day, he walked around for ten minutes he could burn up to 500 calories a week and, brisk walking can dramatically reduce the risk of heart disease. Steve believes that going on a diet is like being punished and, as he hasn’t done anything wrong, he doesn’t want to be punished! But he is a man who just can’t say no! Not when it comes to food. Gizzi showed him a plate of 26 jam doughnuts and said there is the same amount of fat in his curry as there is in that many doughnuts! Steve said she was joking. But, she was deadly serious – there is 74grams of fat in just one meal! Almost a whole daily recommended allowance. Gizzi said that when most people cook a curry, they use way to much oil which is definitely not good for the ticker. So, instead, she chose to use groundnut oil but, she said vegetable oil would be fine. Of course, she measured the oil into the pan as always. Gizzi used chicken thigh on the bone to add loads more flavour and, of course, it’s much cheaper than chicken breasts. The finished article looked amazing with its dollop of Greek yoghurt and the fresh cucumber and tomato salad. Steve’s Friday night, fat-fest takeaway muscles its way in at 74grams of fat per portion. 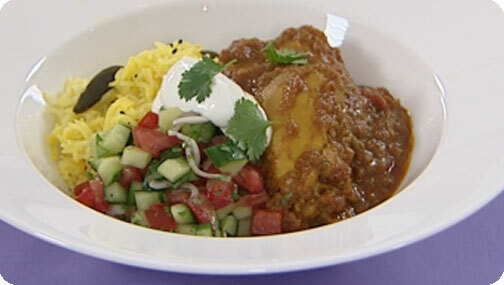 Gizzi’s home-made but authentic curry with yummy accompaniments wins the day with just 9.3grams of fat per portion. That is a FRACTION of the fat in Steve’s takeaway! ‘For me that’s not a compromise. I honestly think I would prefer this to a takeaway.’ And Steve agreed! He also asked if Gizzi delivered on Fridays! They might be easy Steve, but they are definitely not healthy. So Gizzi’s challenge was to take this calorie-fest downfall dish and turn it into something deLITEful! Gizzi asked Steve to guess how many calories there are in his Nacho dish. He reckoned on around 300 and this is the problem when you need to lose weight, most people have no idea how many calories are in their favourite foods. Now that is where Cook Yourself Thin can help with its huge food and drink database. To guess the right calorie amount, Steve would need to add at least another zero on the end to even be close. Yep, 3086 calories in one dish! He was totally shocked! Gizzi told him she was going to be doing him a dish called a Quesadilla, still sticking to the Mexican theme of his Nachos. It’s a Mexican style stuffed pancake using tortillas. She was also making home-made guacamole and gave Steve a great tip for getting juice out of a lime. She said to roll it on around with your hand putting pressure on it then, when you cut it, it should be really nice and juicy. While Steve and Gizzi were making the guacamole, he said it had a lovely colour with the green of the avocado and the reds from the chilli and tomato. Gizzi also made a home-made salsa and said she loved this kind of food because it is so vibrant and colourful. Steve still got his cheese though, Gizzi included some grated cheese and then some low fat cream cheese in the filling, along with mango, spring onions, jalapenos and smoked chicken. Yum! The finished article looked fantastic on the plate. The gorgeous green of the guacamole and the contrasting red of the salsa, nestled either side of the tasty-looking quesadilla. Mmmmmmmmm! Mexican is definitely one of this writer’s favourite foods. Steve’s signature Nachos weigh in at a staggering 3086 calories per portion. 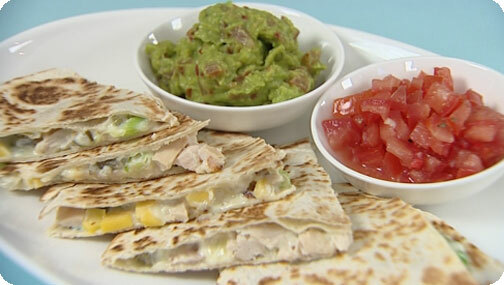 Gizzi’s vibrant Smoked Chicken and Mango Quesadilla comes in way under at 452 calories per portion. That is six times less calories in one dish! Gizzi asked what he thought to the alternative and he said there was no contest, the Quesadilla was lovely so, another triumph for Gizzi. Steve had the face of a child at Christmas when he looked in the bag that Gizzi had handed him! And inside he found a special lunch box to fill up in the morning so he has his lunch on hand instead of sloping off to the drive thru! If all Steve does is swap his meals for Gizzi’s lower calorie, lower fat versions and walk for half an hour a day, he could save 5000 calories a week and shed over three stone in six months! Now THAT is how you cook yourself thin!